Southern Illinois University School of Dental Medicine (SIU SDM) first-year students, along with students in the International Advanced Placement Program (IAPP) received the traditional coat of medical professionals, during the School’s 17th annual White Coat Ceremony held Friday, Oct. 6. The first-year cohort of 51 students, and six IAPP students, took the professional oath of ethics and committed to uphold the School’s values of service, respect, integrity, compassion and competence. SIU SDM alumnus Christopher Larsen, DMD ‘88, was the keynote speaker. Larsen serves on the Illinois State Dental Society Foundation Board of Directors. He practices general dentistry with his daughter and fellow SIU SDM alumnus Jennifer Worner, DMD ‘15. Larsen is a past president of the SIU SDM Alumni Council, where he continues to actively serve as a member. He expressed to the future dentists that the degree they are working toward would help connect the dots along their life journey. It will provide prosperous and impactful opportunities. It will change their lives, and importantly, the lives of others. Ken Rawson, DMD, interim associate dean for academic affairs, led the ceremony. He introduced and celebrated biomedical and clinical sciences faculty, who will play an integral role in the professional preparedness and development of the two cohorts. The SIU SDM White Coat Ceremony was sponsored by the Central Illinois Academy of General Dentistry, Illinois Section of the American College of Dentists, Illinois State Dental Society Foundation and the Eighth District of the International College of Dentists. Photo: SIU SDM Fall 2017 first-year cohort and International Advanced Placement Program students. 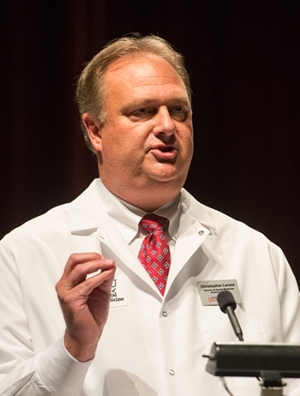 Christopher Larsen, DMD, a 1988 alumnus of the SIU School of Dental Medicine, served as the keynote speaker for the School’s 2017 White Coat Ceremony.